We had such a great week in Loreto it was almost sad to leave. But we packed our bikes into our friend’s truck and got the easy ride up into the mountains, from Loreto to where we left off on the Baja Divide route. After a few goodbyes and a quick selfie we put our bikes back together and rode off toward San Javier Mission, late in the afternoon. Is Solstice tonight or tomorrow, I asked Neon. Tomorrow, he replied. Good, I said, then we can find a nice camp, and watch the sunset with all this wine I’m packing. San Javier Mission is supposed to be pretty cool, I add; I want to take some time to look around and see that three hundred year old olive tree. It’s getting late, but it should be pretty easy to find a camp shortly after the mission site. We cruised into San Javier Mission, took a few photos, then rode several kilometers past the edge of town, and past several ranches, before weaving our bikes through a grove of coral bean trees, and vines that looked a bit like wild bougainvillea. As we settled in for the night a deep disappointment hit… Oh no! I forgot to look for the olive tree. How far are we from the mission? We can go back in the morning. I can’t believe I forgot. [if you know me even a little bit, you know how important plants are to me]. I grumbled for a bit as I inspected the cool vines sprawling everywhere. They have a huge seed I tell Neon. Really big for how little the flowers are. I slowly let go of the olive tree, commenting that there would be many more cool things along the way. But I still couldn’t believe that I was so distracted that I completely forgot about a three hundred year old olive tree, three hundred years old, an olive tree. How could anyone forget about a three hundred year old olive tree? The sky grew dark and the mosquitoes grew fierce. I unpacked my headnet, pulled it over my head, and laid down to sleep. I didn’t sleep that well with the mosquitoes whining all night, but the sun rose and slowly drove them away. The riding was good, up and down hills, with beautiful water crossings. We stopped for lunch on a large plate of rock on one of the rivers, palm trees graced the riverbed on both sides. The rest of the day brought the same …up into dryer hills, down into river oases. Just before camp we met two other Baja Divide riders, Brian and Janet, on a tandem! They’re from California, and have ridden all through Mexico, and Central and South America too. We all camped together and watched the sun set on solstice eve. The night brought more mosquitoes (another headnet night). I fell asleep to the tiny whinings of flocks of mosquitoes. We’re early risers so we bid our farewells to Brian and Janet and headed out as the sun rose. The riding was pretty easy, except for a few rocky, and sandy, water crossings that took some patience and a little hike-a-bike to cross. We arrived in Ley Federal just after the Tienda closed. We decided to continue on to to the next town with the supplies we had. The kilometers cruised by quickly and we started looking for camping on the outskirts of Cuidad Consticion. We kept passing potential camp sites, thinking we’d find a better one, until we found our selves so close to town that the orange grove farms, ranches, and fences, limited us to a roadside camp. We finally settled on a slightly out of sight dip in the landscape, near a Y in the road. We pushed our bikes in and hunkered down, watching farm trucks pass as the sun set. I could hear music in the distance. Dogs barked. Cows grunted to each other across the ranches. I had a difficult time falling to sleep, so close to the road, in such a populated area. Around midnight I woke to the sound of thunderous footsteps and the loudest elephant bellow I have ever heard. I saw large beasts, elephants, near a grass hut, before I realized I was dreaming. Jeez, what’s it like to bike-pack in Africa, I wondered. Then I sat up quickly to the sound of deep thudding footsteps. Cows! Can they see me in this ditch? How will they know I’m here? I don’t think they see very well, and it’s completely dark out. The thudding grew closer. I got out of my sleeping bag, stood up, and stomped around loudly. It bellowed at me. It’s so close! I stomped around a few more times. Neon grumbled. I told him to go back to sleep; I was just saving his life. I heard it wander a little further away. I’m so tired, I just want to get a little sleep. I laid back down, started to drift off, then heard small scratching and digging sounds in the grass. Maybe it’s a skunk, I thought. I’ve heard so many stories of people getting bitten by skunks. A whole other world comes to life after dark. I rattled my bottle against my bike, and tried to fall back to sleep. I woke before dawn. I turned to Neon… let’s go to town and get breakfast; I want hot coffee! We were in town in less than an hour, checked into our hotel, and went out in search of hot coffee before even showering. We found a place just down the street; as we approached, someone waved at me. It’s Brian and Janet I told Neon. We all had breakfast together, and chatted about bike routes in Mexico and South America. The next morning we had breakfast at a nearby coffee shop. The espresso I ordered might just have been the best espresso I have ever had. I ordered a double. What she brought me looked like it was maybe half an ounce. I looked at her and asked, “¿Esto es un doble?” Si, she replied. I looked at Neon; I don’t think this is even a single. Then I took a sip, and my whole body melted. Oh, this is good! I think this rivals any espresso I’ve had in Italy. After that I didn’t care how small it was, though I fantasized about swimming in a vat of it. This is all I want for Christmas, more coffee like this. We should bicycle across Italy, I told Neon. After breakfast we went back to our hotel, packed up our bikes and rode to the local bike shop, PROBIKE, to get new chains installed. Then off to the supermarket to resupply, before heading out of town late in the afternoon. The route leaves town and follows pavement for several kilometers before turning into the “burning dump”. I stopped and said “this is it. This is the dump we’ve heard about.” We rode in, two dogs laid in the shade under an old pickup bed. They had flies in their eyes. They didn’t bark; they didn’t even look at us. One lifted its head, slightly. A little further in we passed three guys. There were two younger ones leaning against some garbage with their heads down; they didn’t lift their heads. An older guy on the left was standing, looking at the ground. No one made eye contact. I wondered what they were doing here. Were they that poor that they came here to look for rotting, burning, food? Were they meth addicts? Who ends up here? We rode on, past fermenting grapefruit, rotting fish, clam shells, tomatoes, Burning plastic, car parts, and broken glass. The place smelled worse than I was anticipating; it made my nostrils tingle. We made it well past the burning dump before setting up camp in the desert. In the night I heard digging behind us. Then Neon grunted a bit in his sleep. I touched his shoulder; he said warthogs were chasing him. I told him it was probably just the digging sound behind us. Later I woke again to horses galloping nearby. I sat up to see if they were near. Despite the digging, the warthogs, and the horses, I slept great and woke excited to be out bikepacking on christmas day. We rode into the San Luis Ganzaga Mission site early in the morning. The tienda was closed since it was Christmas Day. A family across the street from the mission invited us over to fill our water bottles. They offered us coffee and food, but since we had already eaten we declined, but thanked them graciously. We left the mission and cruised through the afternoon hours. Toward the end of the day we climbed higher into the mountains. We found a place to camp down an old road. We heard donkeys in the night, and some nearby scratching sounds. The next day brought more climbing, more river crossings, up and then down and then, up, up, up into the mountains. We filled our bottles at a few of the water crossings, and cleaned ourselves up a bit too. We found a place to came uphill from La Soledad. As the sun set I started feeling sick, sneezing, coughing, runny nose. It came on fast, and with a bang. Neon started coughing a little too. My eyes itched and my nose wouldn’t stop dripping. Toward dark the mosquitoes came out in force. Great, now I have to wear the headnet to bed. That’s just what I need with stuffed up sinuses. I tossed and turned all night, suffocating from the headnet and stuffy nose, and listened to the constant whining of mosquitoes. Donkeys past nearby in the night. Goat bells chimed. And owls called across the hillside to one another. I woke worse than I had fallen to sleep. Neon was sneezing now too. My sinuses were so clogged. Neon suggested it might have been the water we cleaned up in. We climbed higher into the mountains. I felt a little dizzy, and walked some of the downhills since I felt so out of balance. We finally arrived at the top, to the view of a two thousand foot descent down to the Sea of Cortez. Down, down, down, much faster than all that up. We turned to San Evaristo to buy more food. We sat on the porch of the tienda for a long time before leaving. We rode along the Sea of Cortez for several kilometers until we found beach access through a wash. We set up camp between beach plants. I ate, and laid down to sleep before the sun had even set, watching frigate birds in the sky as I fell asleep. There were no mosquitoes, no donkeys, no cows, no elephants, and no warthogs. This must be heaven I thought. My thermometer showed it was ~75°F, but I was completely bundled up, wearing my tights, socks, puffy, and head-buff to bed, fully cinched up in my 10° sleeping bag. It felt unbelievably cozy. I was so happy to lie here in this beautiful place. I fell asleep quickly, waking a couple of times to pee and guzzle water. I slept for fourteen hours, a good feeling kind of sleep. I didn’t want to leave. But we finally packed up our things. I found a questionable looking spider under my ground sheet, and Neon found a little scorpion under his sleeping mat. The day started off with a big uphill with lots of hike-a-bike pushing. It was draining. I wasn’t feeling any better. But I hoped that all this hard work and sweating would push this alien out of my body and sinuses. 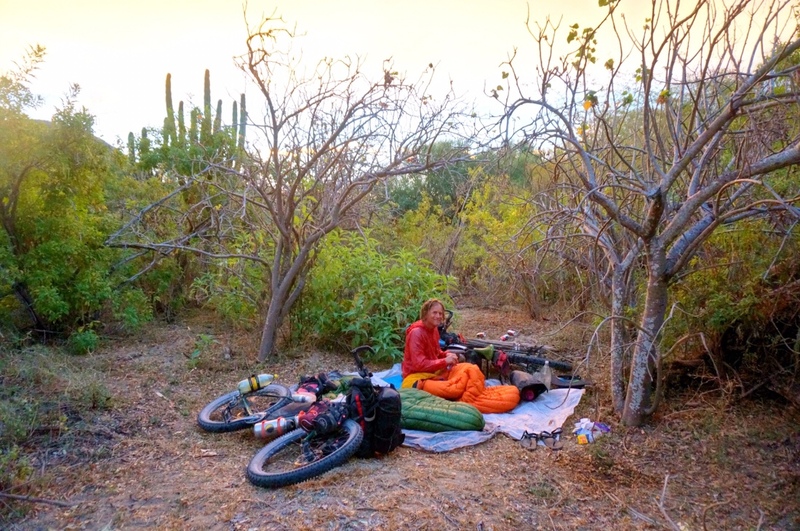 We spent several hours, pushing, riding, and resting under trees, before deciding to hitch into La Paz to find a cheap hotel with a hot shower. It took about fifteen minutes to get a ride, but a big pickup stopped, helped us load the bikes, and drove us to the outskirts of La Paz. We found the closest cheap hotel, showered, and went to bed before sunset again. I woke late. My head was pounding. We decided to ride into La Paz Centro, a few kilometers further. Riding a bike never felt so bad, that round and round motion of the tires, the ground wizzing by, being dizzy and unbalanced on a machine that requires balance. It hurt, but we made it to a cheaper hotel (Hotel Baja California), with hot water and good wifi. I crawled into bed and didn’t move. We spent four whole days in La Paz before we felt up to riding again. We left early to conquer the seven hundred meter climb before needing to camp. We found a place to camp in a wash. In the night I heard a cow bell approaching. It took a while to open my eyes and focus. I sat up and looked at the cow. It turned its head and looked in my direction. It just stood there for a long time, and then turned around and walked out the way it came. They next day was great riding. We were both feeling better. We stopped at a couple of tiendas for drinks and snacks. The plant life was getting more dense. It took a while to find a place to camp, but we finally found an open path through the dense foliage. We wove through trees and bushes and vines to a secluded spot surrounded by mesquite-looking trees, coral bean trees, organ pipe cactus, and a few cardons. As the sky grew dark several bats swooped by, inches from my face. They’re smaller here than in Arizona, more like the size of a luna moth. I woke feeling a lot better than I had in at least a week. The riding was more difficult, with a lot of sand, but we made it to Todos Santos by late afternoon. Our friends from Maryland we’re waiting for us there so that we could all climb the state highpoint of Baja California Sur, Sierra la Laguna highpoint, together. We spent a day in town, watched the baby turtle release, and supplied for three days in the Sierra la Laguna mountains.